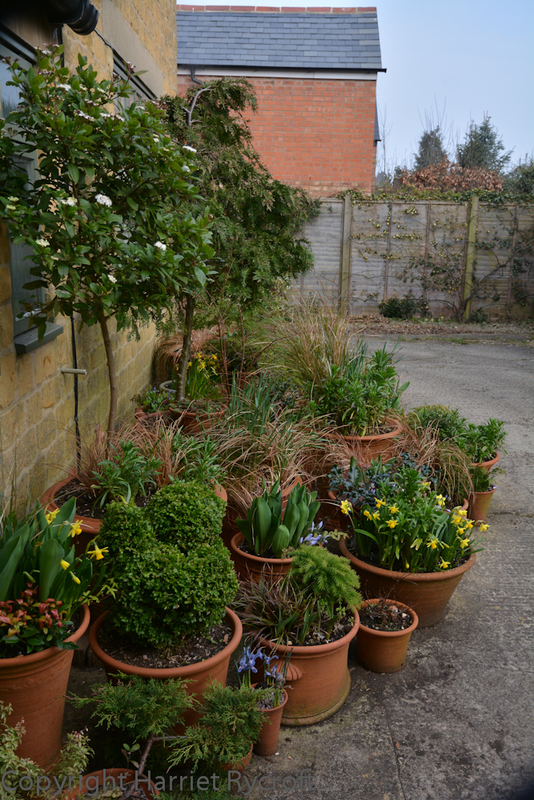 I like to plant a lot of pots just outside the back of our house. 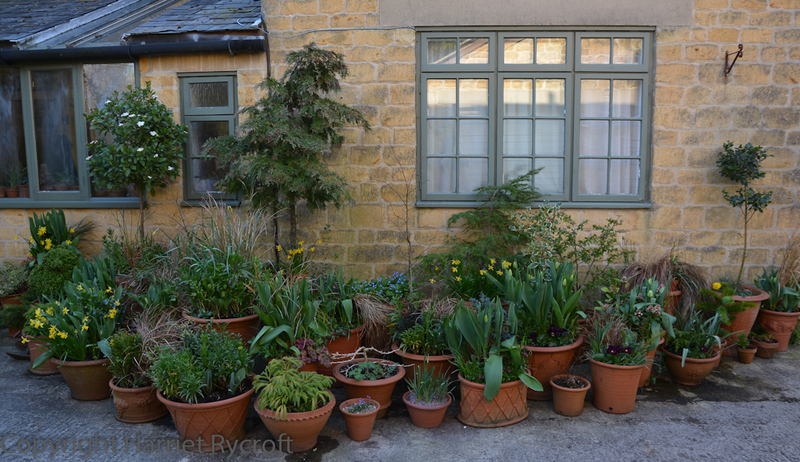 It welcomes guests and gives us something other than concrete to look at from the kitchen window – sadly we can hardly see our garden from the house. 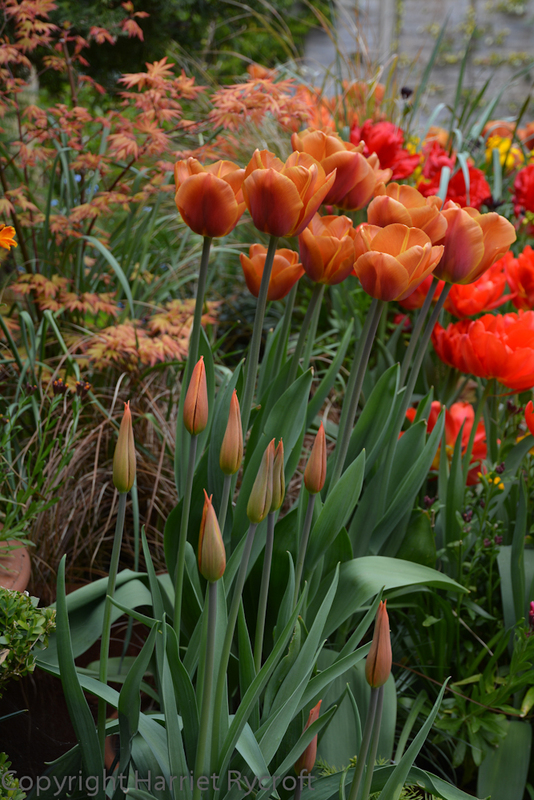 This year I wanted bright and warm colours, with plenty of fragrance, around a skeleton of green and brown foliage. It’s an east-facing wall, and can seem a bit chilly. 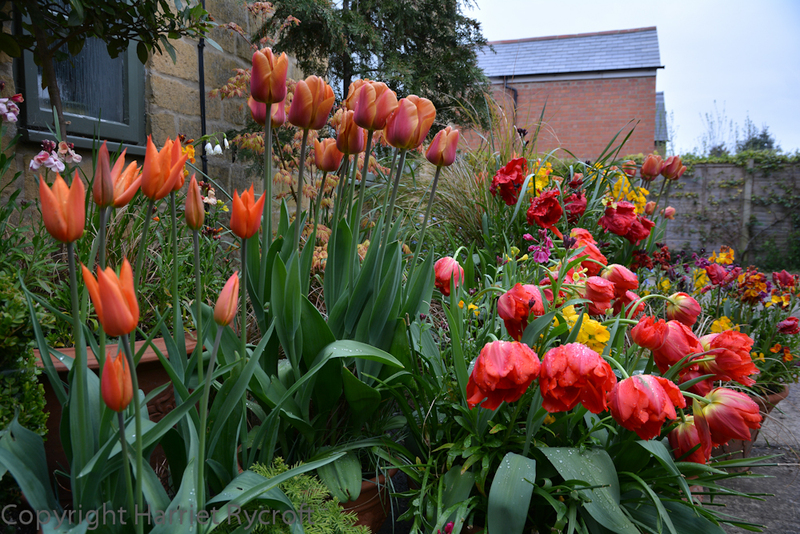 I planned to have more creamy yellow, and slightly less bright red and orange, but one of my suppliers (who shall remain nameless) provided Tulip ‘Ballerina’ instead of ‘Elegant Lady’, and a Tulip ‘Flaming Red Parrot’ which was much redder than the one they supplied last year! Never mind, at least none of it was pink – I would have had to remove that. Luckily ‘Ballerina’ is one of my favourites. The plantings were assembled in October and very little was moved until May. I’ll now bombard you with pics so that you can see for yourselves how the group developed. 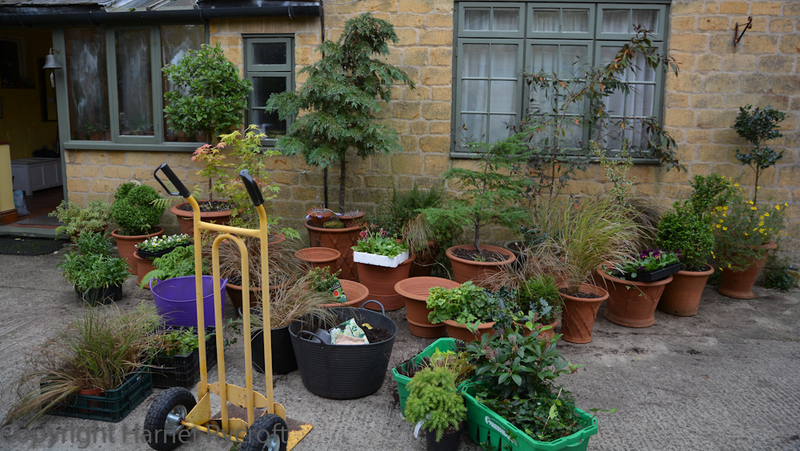 20 October 2014 Under construction, evergreens positioned first, then deciduous shrubs, bulbs, perennials & bedding. 3 Feb 2015, frost and snow. 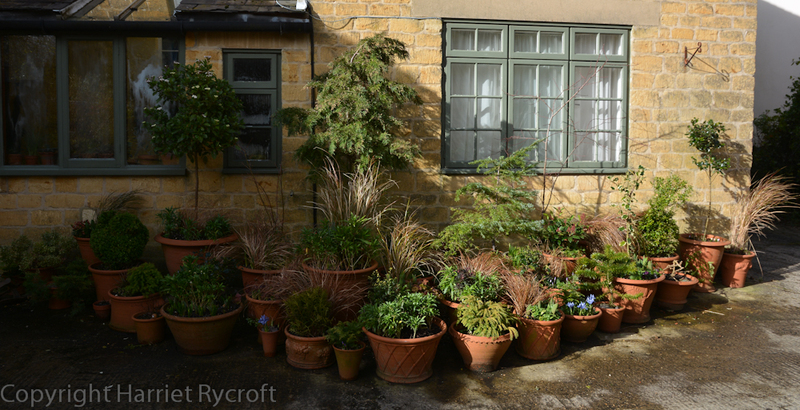 No casualties, but the tree surgeons have moved some pots while clearing up chippings. 2 March 2015. Iris popping up. 6 April 2015. 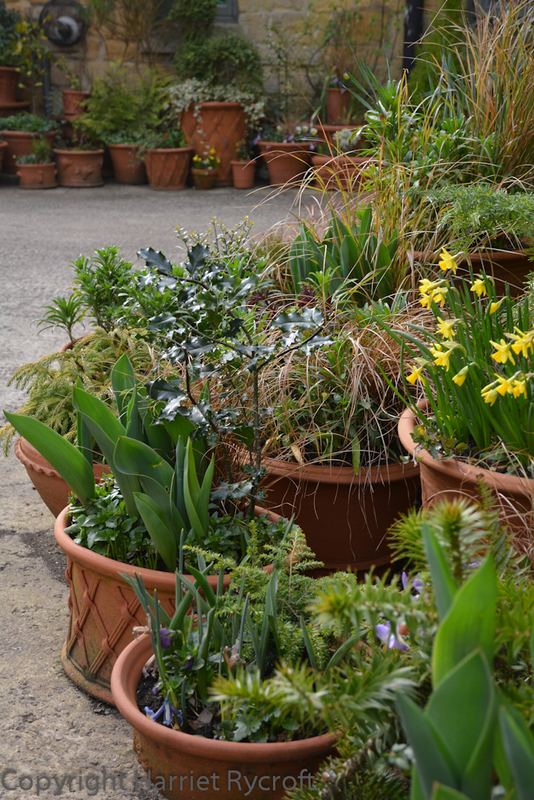 The narcissus in flower is ‘Tete a Tete’ (somebody please tell me how to add accents and circumflexes! 26 April 2015 Still looking good after heavy rain. 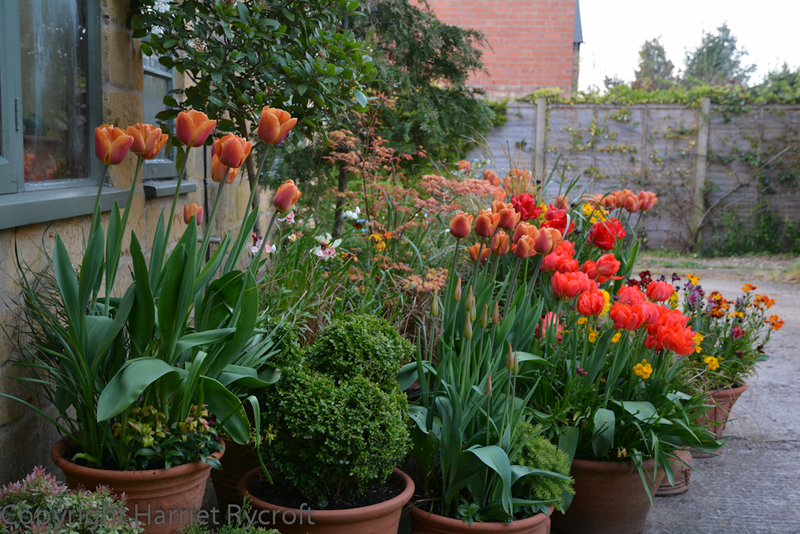 The double red tulip in the foreground is ‘Viking’, and it stood up again once the rain had dried. 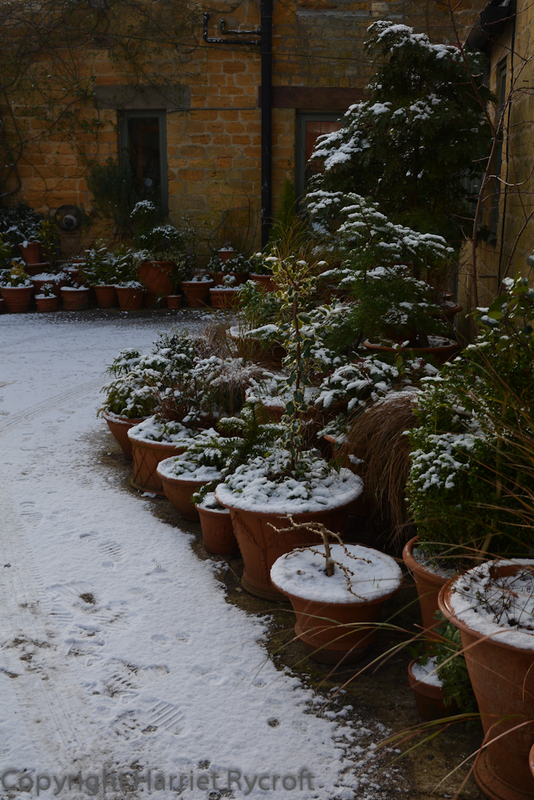 This is the first thing people see as they come round to the back door. 16 April 2015 Here we go. 27 April. The wallflowers get going. T. ‘Brown Sugar’ starts to look a little tired but T. ‘Ballerina’ is looking very perky. 27.April 2015. They always look their best with the sun shining through them. 8 May 2015. Day of writing this. 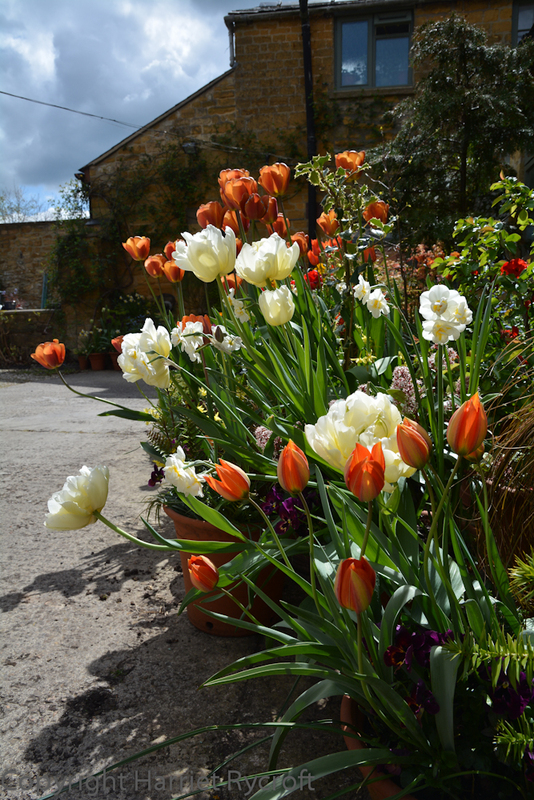 Tulips badly battered by wind but still trying their best. ‘ Brown Sugar’ has had its day but in the background you can see ‘Yellow Flight’, which has only just coloured up. 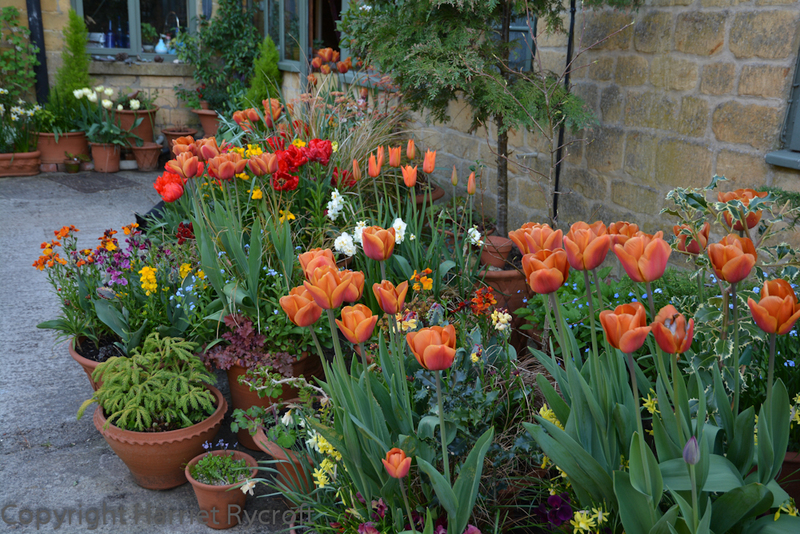 Tulip ‘Brown Sugar’ (from Peter Nyssen) was the backbone of the display, with a brown Carex (seedlings of ‘Curly Wurly’), Anemanthele lessoniana, and an acer, whose name I forget. It was a real star, not just for its delicious colour but also a sweet scent, a bit like wallflowers but coming earlier in the season. Ballerina to me smells of freesias – but friends tell me that it smells of oranges. It looks fresh, anyway. 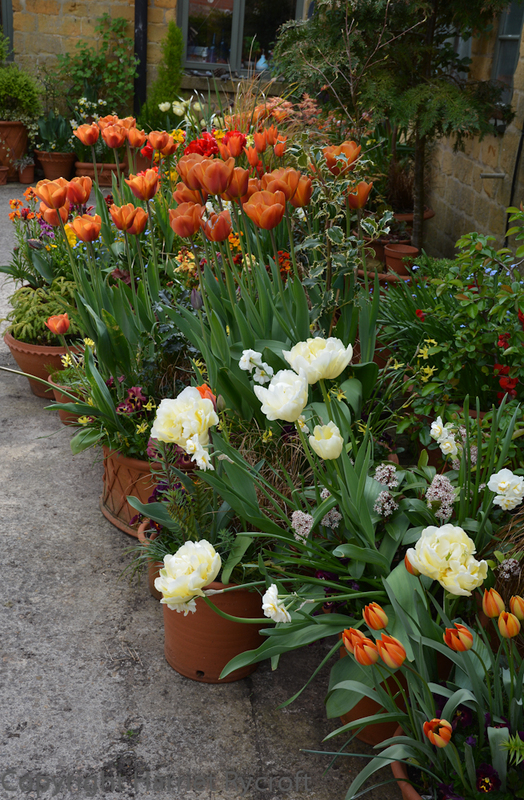 Tulip ‘Verona’ (a gift from Corina Duin), with its big double yellow/cream flowers smelled to me like lemon posset but my husband assures me it’s lemon bonbons. Wish I could send you the fragrance of all of these and the wallflowers! I love “Brown Sugar” what an amazing colour. 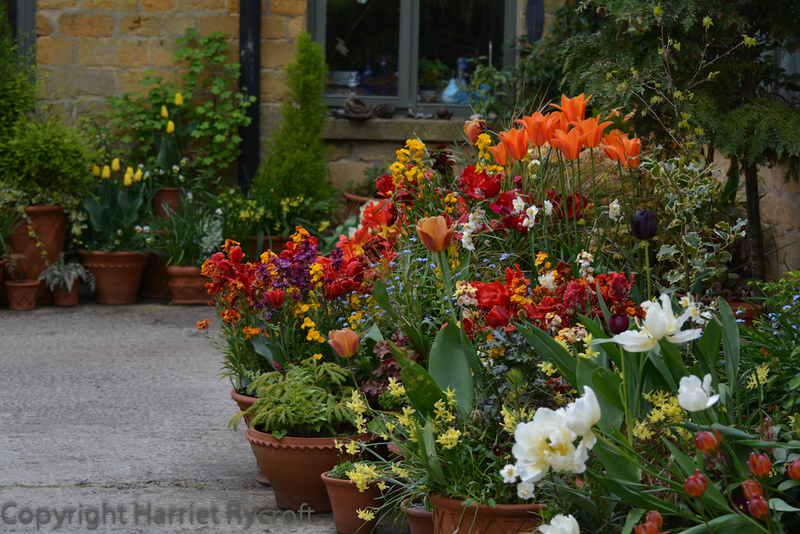 It looks fantastic Harriet, can’t wait to see the next season display! 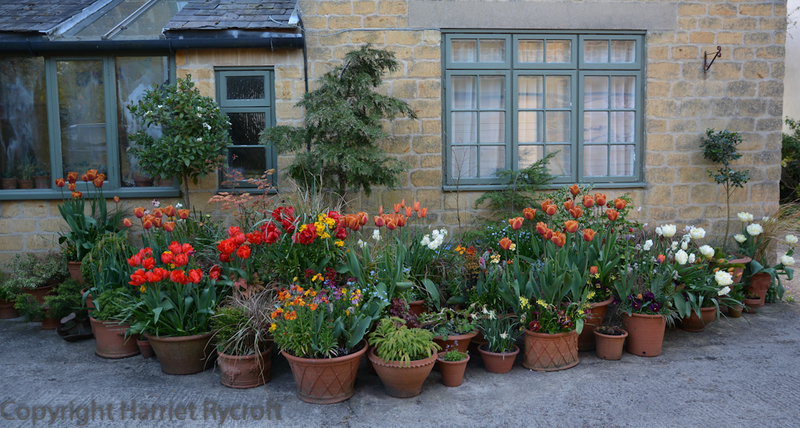 I love the display but all I can think about is the watering of so many pots. I know what you mean, Christine, but this group faces east and is only in sun until about midday. 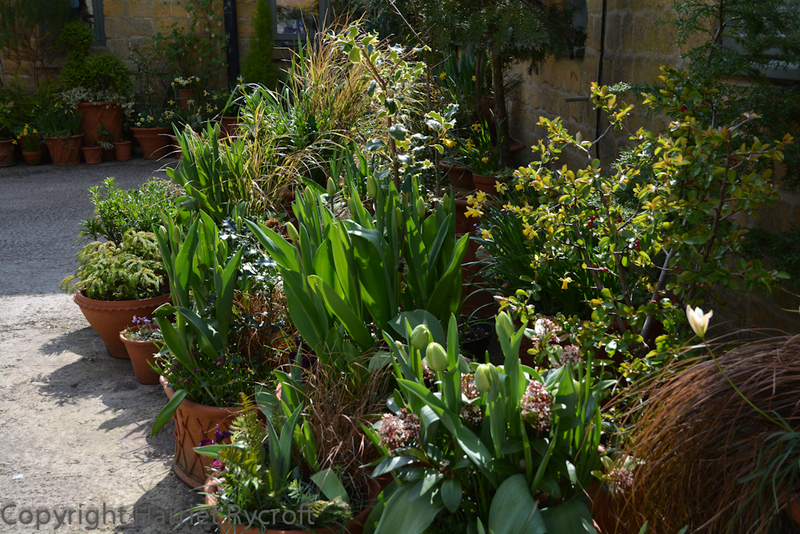 Keeping the pots grouped means they don’t dry out as quickly as single pots, too, so the watering isn’t too bad. Honestly! Thanks Gill, yes Brown Sugar definitely a big favourite for me – have been wanting to grow it for ages, having first seen it at Chelsea a few years ago. 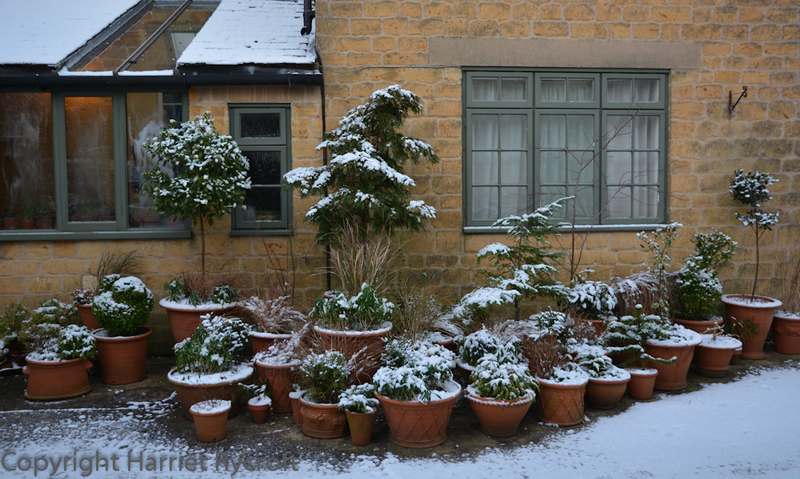 Thanks Kathy – it makes it all worthwhile when I can share the pics and maybe give people a few ideas. 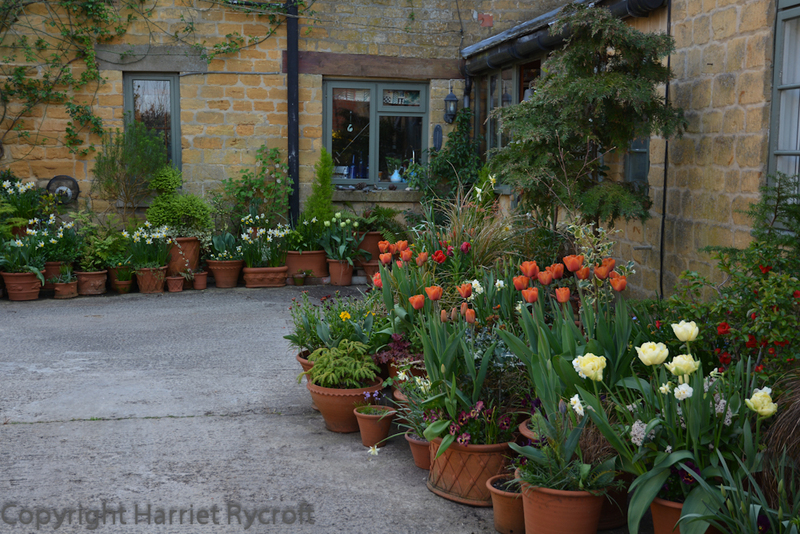 What will you do with the containers when the spring flowers have gone over? 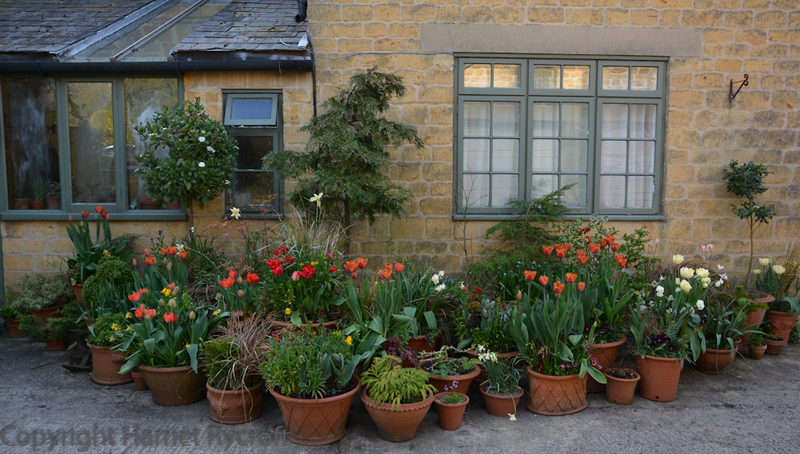 Eg, tulips, narcissi, and wallflowers? Ah, Kathy, that’s a whole other blog post! 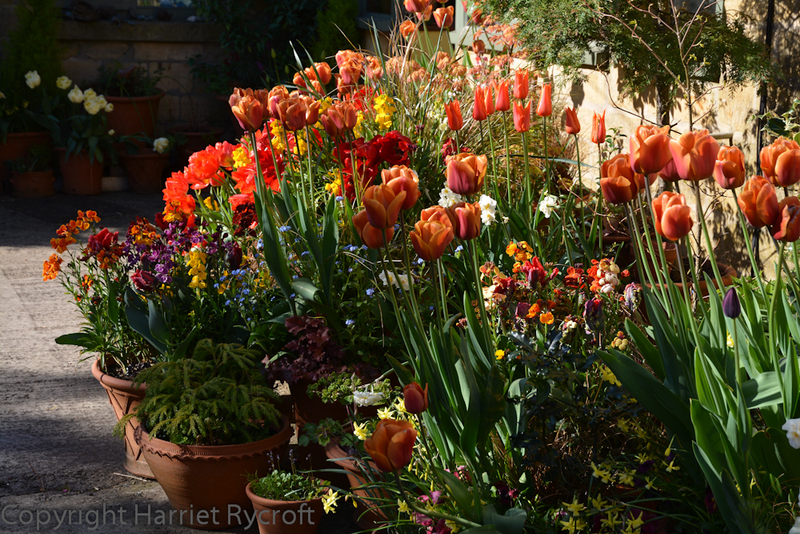 Generally the wallflowers get composted when they have finished flowering, tulip bulbs which are a decent size get shoe-horned into the garden, otherwise they are composted, Narcissi are either repotted or planted in the garden, some of the smaller ones may stay semi-permanently in their pots. depending on what they are planted with. Thank you for that. Don’t you feel sad composting tulip bulbs? It would break my heart! Lol! 🙂 I hate to waste plants so I only compost them if they are very small and would take years to grow back to flowering size. 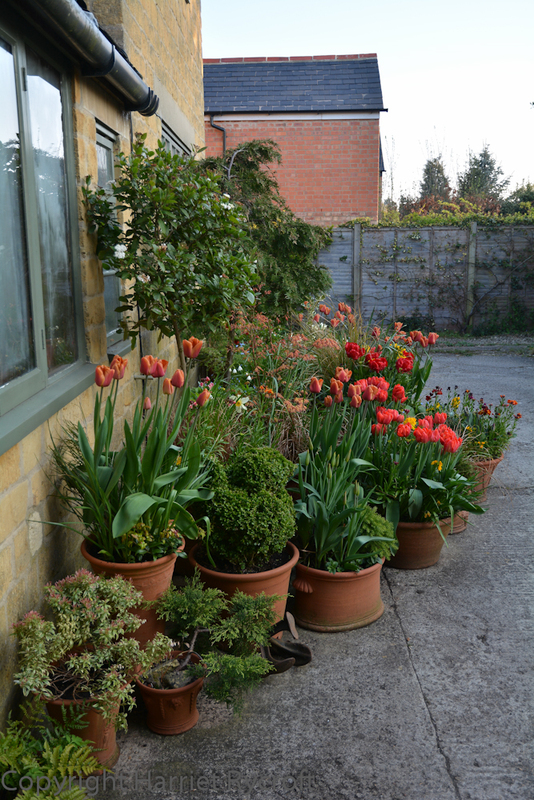 Some tulips just don’t repeat well, they produce small bulbs which struggle to grow to flowering size in normal garden conditions – so I treat those as bedding plants and compost them. 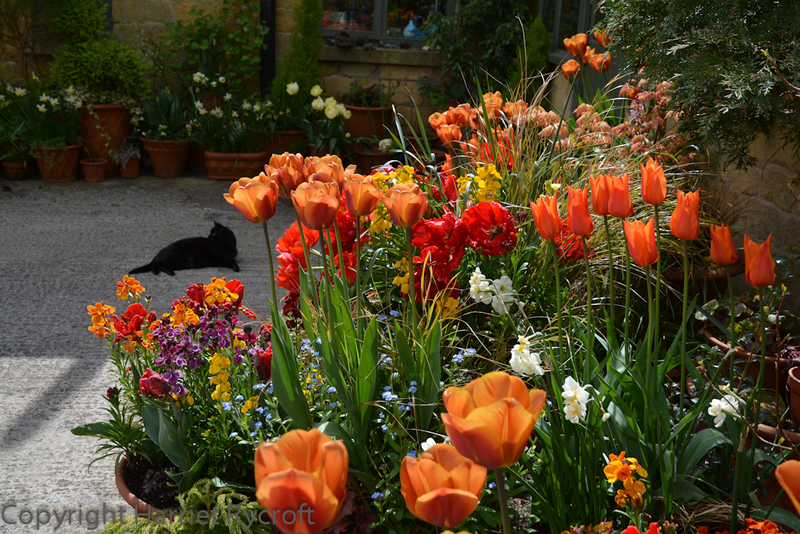 Thank you, ChatsworthLady – it did mean that I had to include rather a lot of photos, but I think sometimes people find it hard to imagine the progression, so photos are much better than any description I could give.